Influencers have become key to brand story-telling. In fact, 2017 was the year that digital influencers overtook celebrities as the most popular choice for brand endorsements for the first time, according to Celebrity Intelligence’s Age of Social Influence report. With Instagram providing quick access to new audiences in our mobile-focused world and an estimated return on investment of £17.21 for every £1 spent, it’s no surprise that 39% of marketers are increasing their influencer marketing budgets for 2018 (The State of Influencer Marketing 2018). But when it comes to selecting Instagram influencers to promote your brand, how do you choose the right fit? Choosing the right influencers to promote your products is based on a balance of engagement and reach. Engagement measures how many likes and comments a post receives – essentially, how many people are interacting with a post. When it comes to Instagram, we recommend working with influencers with an engagement rate of around 5% or above, compared to follower numbers, as this tells us the audience is actively interacting with the post and the influencer. It’s important to note that engagement with your post may not translate to sales. Reach refers to the potential size of an influencer’s audience. A large number of followers is attractive to any brand wanting to get its products in front of as many potential customers as possible, but if no-one is engaging with the post then this metric becomes meaningless. We recommend considering this metric in conjunction with engagement rate to give you a better idea of how many people your post is reaching. 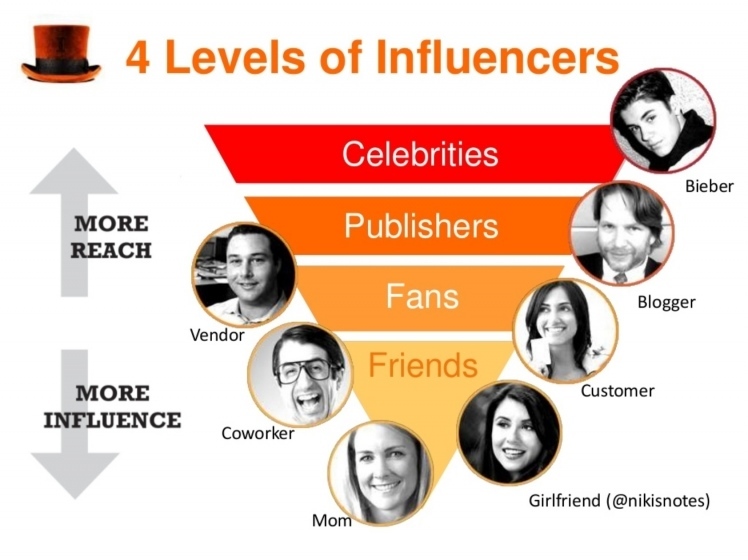 It’s important to keep in mind that audiences have varying levels of trust when it comes to influencers, which the diagram below illustrates. While celebrities and publishers have a much bigger reach due to high follower numbers, the people who wield the most influence are our friends and peers due to our trust in their opinions. Influencers build trust with their audience by being authentic, having a direct connection with their audience and posting honest opinions about products and services, which helps to build engagement. In fact, in Bloglovin’s consumer survey, 61% of women admitted they don’t engage with sponsored content from an influencer if it doesn’t feel genuine. The Age of Social Influence report reveals that many marketers are making 2018 the year of the micro-influencer by incorporating emerging talent and niche influencers, so the next 12 months is likely to bring a fresh wave of micro-influencers into the fold. Micro-influencers have a much smaller following than big players like Zoella, typically between 1,000 and 50,000 followers. With these influencers gaining higher levels of trust with their audience, brands that choose to work with them can expect to see higher levels of engagement. It’s easy to be tempted by big follower numbers on social media, but the most effective strategies incorporate a blend of influencers with a large reach and high engagement levels. Marketing firm Whosay’s 2017 Influence Marketing Insights report analysed more than 300 marketing campaigns and highlighted that influencer marketing achieved twice the engagement rates of other media and advertising campaigns, including a three-fold increase in video views on Facebook. We recommend that brands work with influencers with an engagement rate of 5%. The easiest way to estimate an influencer’s average engagement rate on Instagram is using the Phlanx engagement calculator, which provides an overview based on their last 15 posts. For top tips on getting started with influencer marketing, read Sarah Potter’s guide to The Ins and Outs of Influencer Marketing and check out our Deichmann case study, which incorporated influencer marketing as part of a multi-channel marketing strategy. Find out how influencer marketing could work for you and your business by contacting Anicca Digital and talking to one of our experts.